Thousands of people are expected to converge at the National Heroes Acre today to bid farewell to the gallant daughter of the soil, Mai Maria Msika, who contributed immensely to the liberation struggle and championed women emancipation. Mai Msika, widow to national hero and Vice President Joseph Msika, died last Friday at her Highlands home in Harare. She was 89. Mai Msika married VP Msika, a freedom fighter, despite risks involved, and survived two grenade attacks in 1977. She belonged to a rare breed of women such as the late national heroines Amai Sally Mugabe, Mbuya Maud Muzenda and Mama Mafuyana, who looked after a lot of people after the incarceration of their husbands by the Rhodesian regime. Born on 17 May in 1928 in Bechuanaland now Botswana, Gogo Msika was the eldest in a family of six. She did her primary education at Tsesebe before heading to Gaborone to do her secondary education at St Joseph Khale Catholic school.Gogo Msika then relocated to Zimbabwe, then Rhodesia and enrolled at Usher Institute in Matabeleland South to train as a nurse. It is at Usher Institute that the late Maria met her love, the late Joseph Wilfred who was a woodwork teacher at same institute. At the time of their marriage, the late VP had already become active in nationalist politics. Gogo Msika supported her husband despite the risks involved. Mugabe says Gogo Msika must go and tell Joseph that he is still in charge. President Mugabe says although Cde Msika went to war as a Zapu member and him as a Zanu member, the two parties later united. That unity was grounded on the principle that we are one people. “We are all Zimbabweans. Although we might have different cultures but we are a people together. He says in Gogo Msika, Zimbabwe has lost a rare breed of a woman who sacrificed a lot for this country to be liberated. To the Msika family, let me say your loss is our loss together. Take comfort in that God allowed her to make some accomplishment for the family and the nation,” President Mugabe has taken the opportunity to convey condolences on behalf of the nation, the party and his family adding that the greatest accolade that has been learnt is fearlessness. According to President Mugabe, Gogo Msika was a woman of the people and in most instances, she would send an SOS for food shortly after Government had replenished her pantry. “At some point, the Chief Secretary to the President asked how come you need more food when we just bought food stuffs and she quipped, my grandchildren and relatives have exhausted it all,” he says adding that such a woman she was, her home was always full of people because she was so hospitable. President Mugabe says he knew Cde Msika when they were still young boys. “He was in Bulawayo and I was also in the city teaching at Hope Fountain. We would go with Joseph to watch soccer especially when Highlanders played Mashonaland United (also known as Zimbabwe Saints). We went there to support Mashonaland United. That is the team Joseph supported,” Pres Mugabe said. President Mugabe tells mourners that whites came to Zimbabwe and wanted to make it theirs oblivious of the fact that what is not yours will never be yours no matter how much you fight for it. He thanks Bishop Gandiya for the word from 2nd Corinthians which implores people not to fear death but to know that human flesh is not immortal. President Mugabe takes to the podium and starts with salutations recognising the presence of various dignitaries within the file and ranks of Government. Dr Made has now invited President Mugabe to address mourners. According to Maxwel, in 1977, the Msika home in Pelandaba was petrol bombed and Gogo Msika survived the attack. Mr Msika says his mother was harassed and detained at various stations in Bulawayo as way of trying to force the late VP to come out of hiding for his family. When Cde Msika was subsequently incarcerated at Gonakudzingwa, Gogo Msika struggled to fend for the family and she did well in that regard managing to send all her children to University. "As was the tradition then, after marriage, my mother went to our rural home, in Chiweshe to till the land. Because of her light complexion, people in the village thought Joseph had married a white woman." Mr Msika narrates the history of his mother from her birth in Botswana up to the time she married Joseph. Dr Made has invited Mr Maxwel Msika, the Msika family representative to address the mourners. Director of Ceremony, Dr Joseph Made who is standing in for Minister of Home Affairs, Dr Ignatius Chombo who is in Mozambique on party business has invited Bishop Chad Gandiya to give today’s reading. Bishop Gandiya tells mourners that death is not the end because for believers, there is hope for resurrection when Jesus comes. “Gogo Maria, you have finished your race. Thank you. Till we meet again,” says Bishop Gandiya. Mourners have braved the scorching sun to come and give a befitting send off to Gogo Maria, the woman provided companionship, moral support and courage to the late VP Joseph Msika. The traditional service provider, Doves, which has over the years ensured decent burial for gallant sons and daughters of the soil has not disappointed either today and has provided umbrellas and sun hats to the multitudes here. 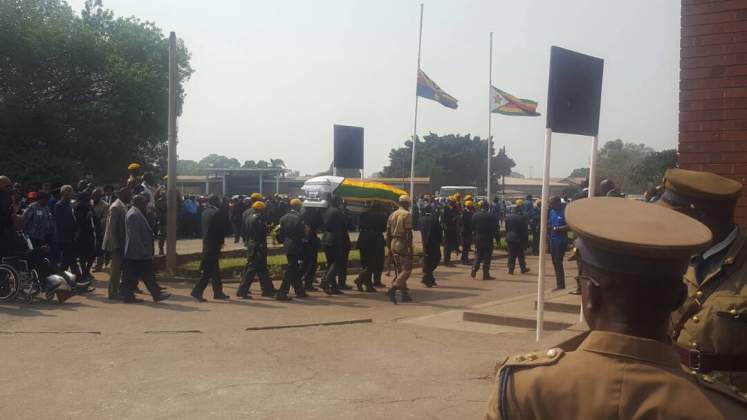 The body of Gogo Msika has arrived accompanied by President Mugabe and First Lady Amai Grace Mugabe and the casket will now be laid at the Tomb of the Unknown Soldier before burial. Service Chiefs and VP Mphoko have arrived at the national shrine. Because of the support she gave her husband, she became a target of the colonial administration which continously harrassed her while her dear Joseph was languishing in prison. At some point, the couple lost their son, Gonakudzingwa when he was two months old due to ill treatment the family got at the hands of the colonialists. Born on 17 May in 1928 in Bechuanaland now Botswana, Gogo Msika was the eldest in a family of six. She did her primary education at Tsesebe before heading to Gaborone to do her secondary education at St Joseph Khale Catholic school. Gogo Msika then relocated to Zimbabwe, then Rhodesia and enrolled at Usher Institute in Matabeleland South to train as a nurse. It is at Usher Institute that the late Maria met her love, the late Joseph Wilfred who was a wood work teacher at the same institute. At the time of their marriage, the late VP had already become active in nationalist politics. Gogo Msika supported her husband despite the risks involved. The funeral procession is now heading to the National Heroes Acre. President Robert Mugabe arrives at Stodart Hall in the company of the First Lady, Dr Grace Mugabe and the two soon lead mourners in the body viewing procession. Now the funeral procession has begun with the arrival of the body at Stodart Hall in Mbare. Mbuya Msika died Friday the 22nd of September at her Highlands home after a long illness. She is survived by three children, Lucia, Shelton and Maxwell, eight grandchildren and three great grandchildren. In 1977 Gogo Msika survived twice grenade attacks by the Rhodesian agents who were bent on demoralising the resilient nationalist Joseph Msika through attacking and harassing his family. late Joseph Msika and Cde Maria Matumo got married on 26 December 1946 and had seven children. Upon completion of her secondary education, Mbuya Msika came to the then Rhodesia where she enrolled and studied nursing at Ashyre Institute in Matabeleland. She later met Cde Joseph Msika who was studying woodwork at the same institution. Born Maria Matumo in Bechuanaland, now Botswana, on the 17th of May in 1928, Gogo Msika attended her primary education at Tsesebe Primary and proceeded to St Joseph Khale Catholic School in Gaborone for her secondary education. The death of Mbuya Msika comes barely a month after the nation lost Mbuya Maud Muzenda, Cde Shuvai Ben Mahofa and Cde George Rutanhire. Gogo Msika died on Friday, 22 September 2017 in Harare.